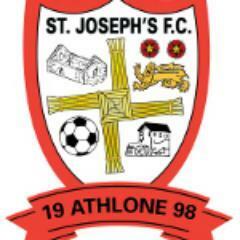 St. Joseph's FC Athlone is a community based boys football club on the West side of Athlone Town. The club was founded in 1998 and has been going from strength to strength ever since. The majority of our boys come from areas such as Monksland, Summerhill, Bealnamulla, Cornafulla, Drum & Clonown. The ethos of our club is to provide a fun and safe environment for boys of all ages and abilities to hone their footballing skills. It is through local clubs like this that lifelong friendships are made. We are a very open club that depends on the active participation of parents through all ages; without this no club would survive. All of our coaches are Garda Vetted and have participated in official FAI courses around Child Welfare and coaching qualifications applicable to their age group. The vibrancy of the club is evident in the numbers that we register each year (250+ each season). We hope that this trend will continue and that the boys that come to our club will find it as fulfilling and rewarding as we do. The age range that we provide football for is 6 to 16 years old. Our boys compete in both the Athlone & District Schoolboys/Girls League (ADSL) and the Midland Schoolboys/Girls League (MSL). We also enter teams in different SFAI cup competitions that are played throughout the season. Our aim is to provide as much football as possible throughout the season. St. Joseph's FC elects an executive committee each year at it's AGM. The committee will meet throughout the year to discuss issues affecting the club. The committee would always encourage parents, coaches & managers to become members of the club in order to have a say in how the club is run.